I’m so lucky to have a handful of fabulous guest bloggers popping in throughout the week while I’m getting ready for Mighty Swell. To kick things off, here’s Libby, from one of my favorite daily reads, pinkshirtsandcarwrecks. Her veggie soup recipe is just the thing to get us all back to healthy, seasonal eating after a weekend full of Cadbury eggs and jelly beans. Don’t tell me I’m the only one with a sugar hangover! Hello everybody! I’m Libby from pinkshirtsandcarwrecks and am honored to help Meghan out while she gears up for Mighty Swell! I thought since spring is teasing us I’d help coax it along by making a fresh spring vegetable soup. 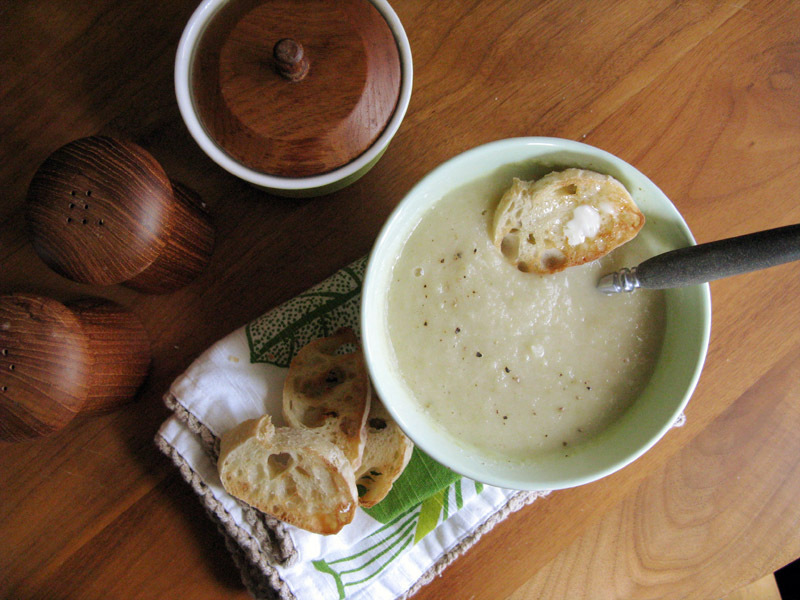 Creamy Celery Soup is delicious and delicious, not to mention healthy! My version is adapted from this recipe from Martha Stewart. Here’s how to make it. 1. 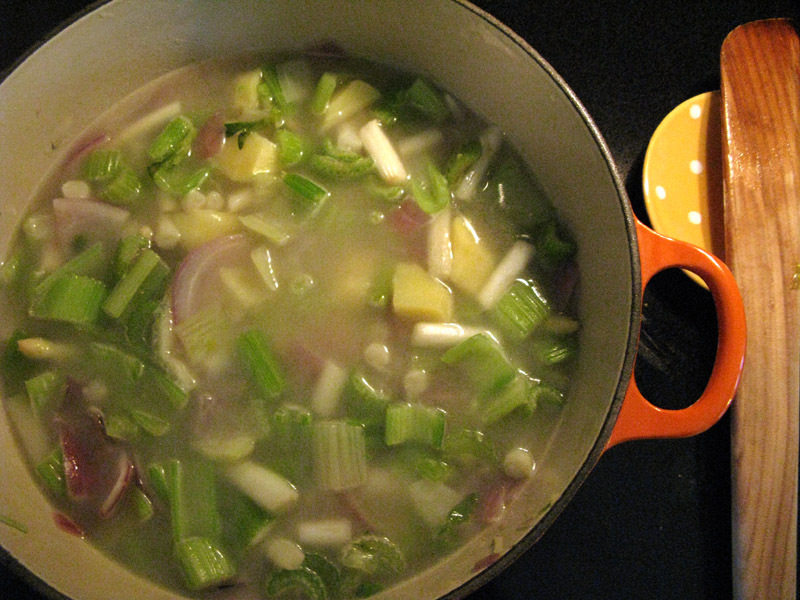 Wash and chop these vegetables: 1 bag/bunch of celery, a few small red potatoes (peeled), one large red onion, three cloves of garlic and one bunch of white asparagus (chop off bottoms – these are too stringy, even when blended in the soup!). 2. 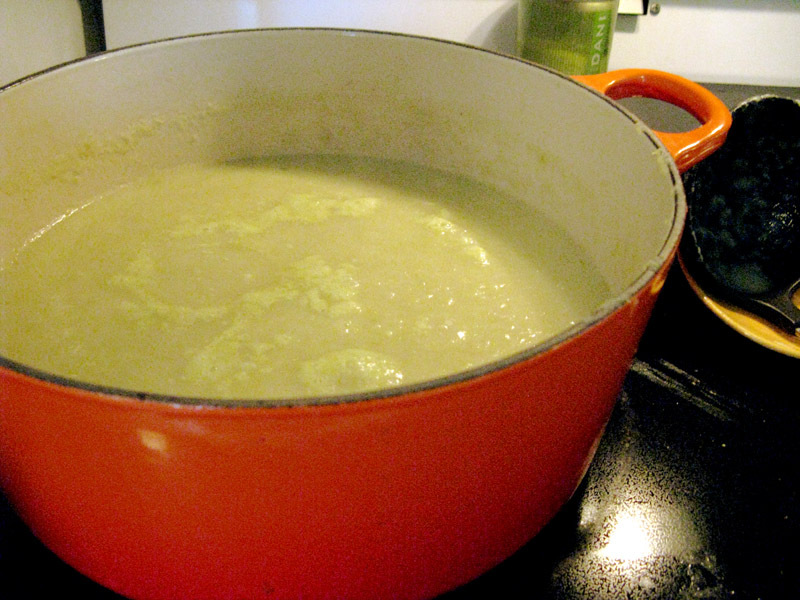 Melt a knob of butter in a large pot/4-quart saucepan over medium heat and add vegetables. Season with salt and pepper and cook until soft. These veggies smell so wonderful cooking! I added asparagus in because it’s in season right now, but you don’t have to if you don’t want. You can add more potato, too, if you like. 3. 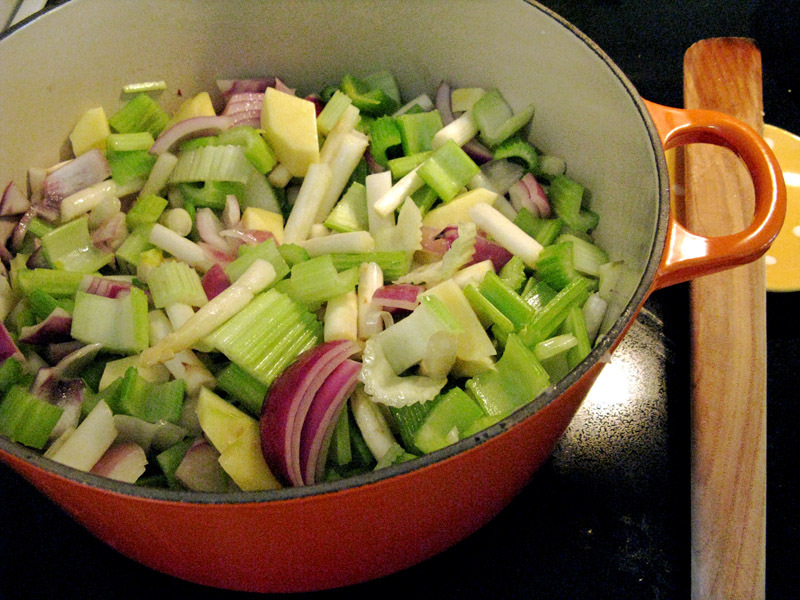 Add six cups chicken or vegetable stock (or water, but stock makes it more flavorful) to the pot and bring to a boil. Reduce the heat back down to medium and simmer (uncovered) until veggies are very tender—fork test them in 20 minutes. 4. Now the fun part! 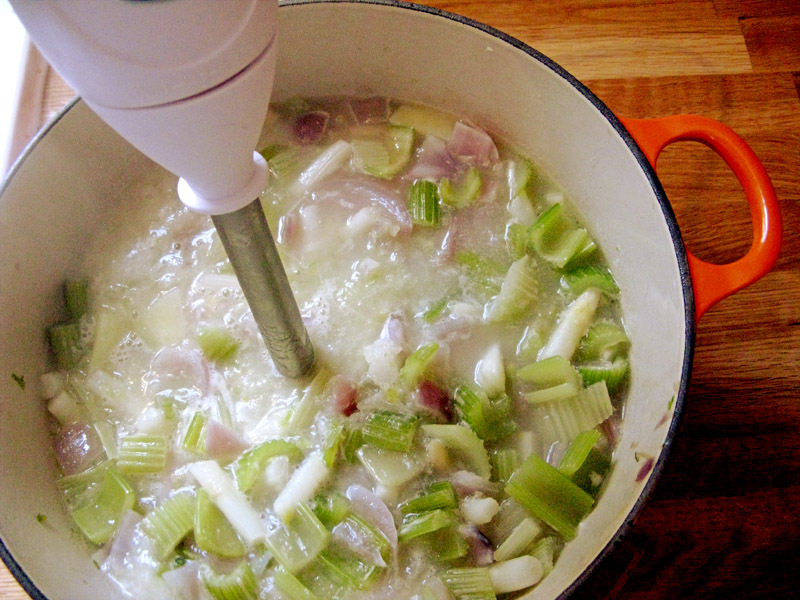 Puree the soup until smooth using your immersion blender (I love this handy kitchen tool! It makes this into a one pot meal. You can pick a cheap immersion blender up at Target—or even Walgreens!—for under $20). Add juice from half a lemon, re-season with salt and pepper to taste. 5. You can also use a regular blender, but you’ll have to work in batches and do more dishes. Read Martha’s recipe for tips on this step if you’re using a stand alone blender. 6. If you still have a few celery leaves they look pretty for garnish. I highly recommend serving this soup with some toasted slices of fresh baked baguette (I broiled them on a cookie sheet in the oven). I like them plain with butter, but you could rub them with a little garlic and olive oil before toasting—they make the best accompaniment to this spring vegetable soup. The whole thing takes less than an hour and it’s a such a treat for lunch or a light dinner or first course. As Julia Child would say, bon appétit! In addition to her awesome blog, Libby also runs not one, but two Etsy shops, one for her vintage finds and another featuring her handmade creations. Check ’em out! This entry was posted in Uncategorized and tagged Etsy, guest post, how to, Martha Stewart, minneapolis bloggers, pinkshirtsandcarwrecks, recipe by highplainsthrifter. Bookmark the permalink.